Moses Fell Dunn graduated from Hanover College in 1862, studied law at Harvard and attended schools in Germany and France. In 1866, Dunn was elected to the state legislature, where he served from 1867 to 1869. Moses and his brother, George, were law partners and also operated a local limestone quarry. 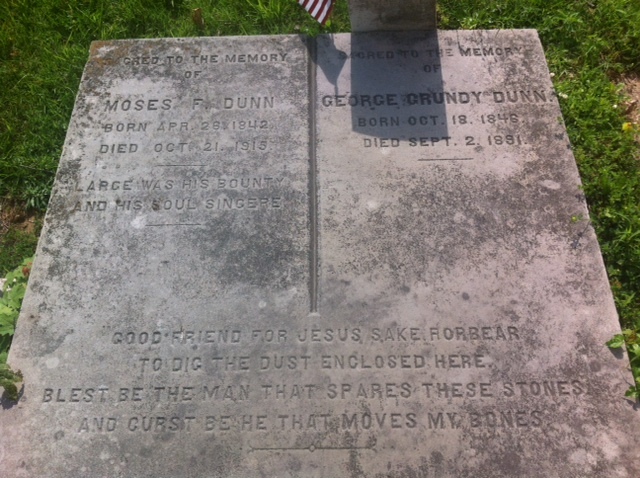 Like his father, George Grundy Dunn, Sr., Moses was known as a great orator as he canvassed the state during the campaign. Moses and his brother resided at the family home until his mother died in 1870. He did not marry, and after his mother's death, he moved to his building on the north side of Bedford's town square. He sold 20 acres of the Dunn family farm in Monroe County to Indiana University to be used for the campus. This includes what is now Dunn Meadow and the Dunn family cemetery. Lawrence County benefited significantly from his generosity in the form of Dunn Hospital and the Dunn Masonic Temple. Dunn also donated "Feldon Fields," northwest of Bedford, to Purdue University and is known today the Purdue Farm.